De industriële revolutie bracht een zeer abrupte wijziging in voedingspatronen mee, nog veel ingrijpender dan de landbouwrevolutie zo’n 10.000 jaar geleden. De industrialisering van de westerse voeding, de massale ontwikkeling en toevoeging van lichaamsvreemde stoffen bleef niet zonder gevolgen. ‘Beschavingsziekten’ sloegen ongenadig toe: de incidentie aan hart- en vaatziekten, hypertensie, diabetes, kanker en vele andere nam epidemische vormen aan, en is nog steeds stijgende. De medische vooruitgang kon daar tot nu toe niets aan veranderen, en spitst zich toe op symptoombehandeling en langer in leven houden van zieke mensen. De lange levensduur waar de moderne mens van ‘geniet’ is vooral gekenmerkt door vele decennia van morbiditeit. Eaton SB, Konner M. Paleolithic nutrition. A consideration of its nature and current implications. N Engl J Med 1985; 1985;312:283-89. Eaton SB. Humans, lipids and evolution. Lipids 1992;27:814-820. Eaton SB, Eaton III SB, Konner MJ. Paleolithic nutrition revisited: a twelve-year retrospective on its nature and implications. Eur J Clin Nutr 1997; 51:207-16. Eaton SB, Eaton SB III, Sinclair AJ, Cordain L, Mann NJ. Dietary intake of long-chain polyunsaturated fatty acids during the paleolithic. World Rev Nutr Diet 1998;83:12-23. Eaton SB, Cordain L, Eaton SB. An evolutionary foundation for health promotion. World Rev Nutr Diet 2001; 90: 5-12. Eaton SB, Cordain L. Old genes, new fuels: Nutritional changes since agriculture. World Review of Nutrition and Dietetics 1997; 81: 26-37. Eaton SB, Strassman BI, Nesse RM, Neel JV, Ewald PW, Williams GC, Weder AB, Eaton SB 3rd, Lindeberg S, Konner MJ, Mysterud I, Cordain L. Evolutionary health promotion. Prev Med 2002; 34:109-118. Lindeberg S, Cordain L, Eaton B. Biological and clinical potential of a Palaeolithic diet. J Nutr Environ Med 2003;13:149-160. Eaton SB, Konner M. Paleolithic nutrition. A consideration of its nature and current implications. N Engl J Med 1985; 1985;312:283-89.Cordain L, Eaton S, Sebastian A: Origins and evolution of the western diet Health implications for the 21st century. Am J Clin Nutr 2005, 81:341–354. Eaton SB, Cordain L. Evolutionary aspects of diet: old genes, new fuels. Nutritional changes since agriculture. 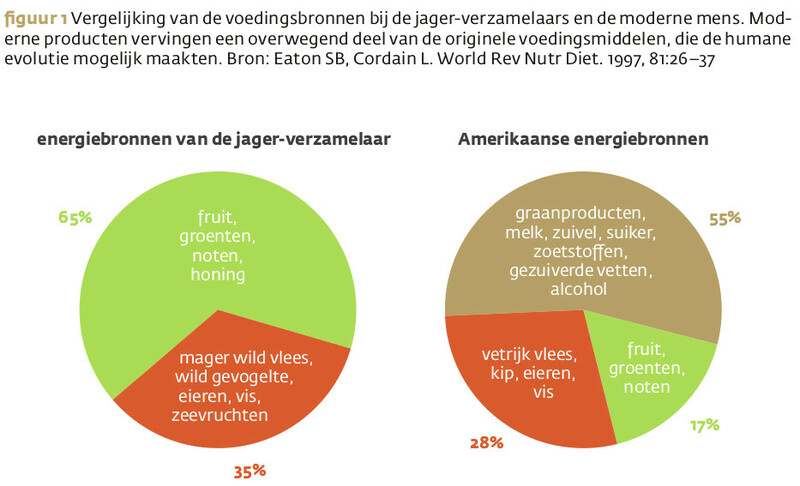 World Rev Nutr Diet 1997, 81:26–37. Eaton SB, Eaton SB III. Paleolithic vs modern diets-selected pathophysiological implications. Eur J Nutr 2000, 39:67–70. Cordain L, Eaton SB, Miller JB, Maan N, Hill K. The paradoxical nature of hunter-gatherer diets: meat based, yet non-atherogenic. Eur J Clin Nutr 2002; 56(1):S42-52. Eaton SB, Cordain L et al. Origins and evolution of the Western diet: health implications for the 21st century. Am J Clin Nutr 2005; 81:341-54. Cordain L. Cereal grains: humanity’s double edged sword. World Rev Nutr Diet 1999;84:19-73. O'Keefe JH Jr, Cordain L. Cardiovascular disease resulting from a diet and lifestyle at odds with our Paleolithic genome: how to become a 21st-century hunter-gatherer. Mayo Clin Proc 2004, 79:101–108. Cordain L, Miller JB, Eaton SB, Mann N, Holt SH, Speth JD. Plant-animal subsistence ratios and macronutrient energy estimations in worldwide hunter-gatherer diets. Am J Clin Nutr 2000, 71(3):682–692. Cordain L et al. Origins and evolution of the Western diet: health implications fort he 21st century. Am J Clin Nutr 2005; 81:341-54. Osterdahl M, Kocturk T, Koochek A, Wändell PE. Effects of a short-term intervention with a paleolithic diet in healthy volunteers. Eur J Clin Nutr 2008, 62(5):682–685. Frasetto LA, Schloetter M, Mietus-Synder M, Morris RC Jr, Sebastian A. Metabolic and physiologic improvement from consuming a paleolithic, hunter-gatherer type diet. Eur J Clin Nutr 2009, 63(8):947–955. Sebastian A, Frassetto LA, Sellmeyer DE, Merriam RL, Morris RC Jr. Estimation of the net acid load of the diet of ancestral preagricultural Homo sapiens and their hominid ancestors. Am J Clin Nutr 2002, 76.1308–1316. Sebastian A, Frassetto LA, Sellmeyer DE, Morris RC Jr: The evolution-informed optimal dietary potassium intake of human beings greatly exceeds current and recommended intakes. Semin Nephrol 2006, 26(6):447–453. Lindeberg S, Jonsson T, Granfeldt Y, Borgstrand E, Soffman J, Sjostrom K, Ahren B. A Paleolithic diet improves glucose tolerance more than a Mediterranean-like diet in individuals with ischaemic heart disease. Diabetologia 2007, 50:1795–1807. Jönsson T, Granfeldt Y, Ahrén B, Branell U, Palsson G, Hansson A, Soderstrom M, Lindeberg S. Beneficial effects of a Paleolithic diet on cardiovascular risk factors in type 2 diabetes: a randomized cross-over pilot study. Cardiovasc Diabetol 2009, 8:35. Ryberg M, Sandberg S, Mellberg C, Stegle O, Lindahl B, Larsson C, Hauksson J, Olsson T: A Palaeolithic-type diet causes strong tissue-specific effects on ectopic fat deposition in obese postmenopausal women. J Int Med 2013, 274(1):67–76. Eaton SB, Konner MJ, Cordain L. Diet-dependent acid load, Paleolithic nutrition, and evolutionary health promotion. Am J Clin Nutr 2010;91:295-97. Muskiet FA. Estimated macronutrient and fatty acid intakes from an East African Paleolithic diet. Br J Nutr 2010, 104(11):1666–1687. Kuipers RS. Lessen vanuit de evolutionaire geneeskunde. AT&A 2012; 38-43. Ramsden CE, Faurot KR, Carrera-Bastos P, Sperling LS, de Lorgeril M, Cordain L. Dietary fat quality and coronary heart disease prevention: a unified theory based on evolutionary, historical, global and modern perspectives. Curr Treat Options Cardiovasc Med; 2009;11:289-301. Kuipers RS, Luxwolda MF, Janneke Dijck-Brouwer DA, Eaton SB, Crawford MA, Cordain L, Muskiet FA. Estimated macronutrient and fatty acid intakes from an East African Paleolithic diet. Brit J Nutr , 2010 Dec;104(11):1666-87. Kuipers RS. Groei en ontwikkeling: lessen uit de oertijd. AT&A 2014; 3:10. Crawford MA et al. Evidence for the unique function of docosahexaenoic acid during the evolution of the modern hominid brain. Lipids. 1999;34 Suppl:S39-47. Crawford MA, Broadhurst CL. The role of docosahexaenoic and the marine food web as determinants of evolution and hominid brain development: the challenge for human sustainability. Nutr Health. 2012 Jan;21(1):17-39. Dyall SC. Long-chain omega-3 fatty acids and the brain: a review of the independent and shared effects of EPA, DPA and DHA. Front Aging Neurosci. 2015 Apr 21;7:52. Janssen CI, Kiliaan AJ. Long-chain polyunsaturated fatty acids (LCPUFA) from genesis to senescence: the influence of LCPUFA on neural development, aging, and neurodegeneration. Prog Lipid Res. 2014 Jan;53:1-17. Ruiz-Núñez B, Pruimboom L, Dijck-Brouwer DA, Muskiet FA. Lifestyle and nutritional imbalances associated with Western diseases: causes and consequences of chronic systemic low-grade inflammation in an evolutionary context. J Nutr Biochem 2013, 24(7):1183–1201. Bosma-den Boer MM, van Wetten ML, Pruimboom L. Chronic inflammatory diseases are stimulated by current lifestyle: how diet, stress levels and medication prevent our body from recovering. Nutr Metab (Lond). 2012 Apr 17;9(1):32. Kuipers RS, Pruimboom L. Short comment on "A review of potential metabolic etiologies of the observed association between red meat consumption and development of type 2 diabetes mellitus", by Yoona Kim, Jennifer Keogh, Peter Clifton. Metabolism. 2016 Jan;65(1):e3-4. de Punder K, Pruimboom L. The dietary intake of wheat and other cereal grains and their role in inflammation. Review. Nutrients. 2013 Mar 12;5(3):771-87. Mellberg C, Sandberg S, Ryberg M, Eriksson M, Brage S, Olsson T, Lindahl B. Long-term effects of a Palaeolithic-type diet in obese postmenopausal women: a 2-year randomized trial. Eur J Clin Nutr 2014, 68:350–357. Abuissa H, O’Keefe, Cordain L. Realigning Our 21st Century Diet and Lifestyle With Our Hunterer-gathere Genetic Identity. Directions in Psychiatry 2005; 25:SR1-10. Nys M. Een nieuw behandelingsmodel voor niet-infectieuze ziekten. AT&A 2013; 4:10-15. Nys M. Het Ontstekingssyndroom. “The Inflammation Syndrome” aan de basis van degeneratieziekten. AT&A 2006; 4:50-55. Bosma-den Boer MM, van Wetten ML, Pruimboom L. Chronic inflammatory diseases are stimulated by current lifestyle: how diet, stress levels and medication prevent our body from recovering. Nutr Metab (Lond) 2012,9:32. Rabinovich GA, van Kooyk Y, Cobb BA. Glycobiology of immune responses. Ann N Y Acad Sci. 2012 Apr;1253:1-15. Iwanaga S, Lee BL. Recent advances in the innate immunity of invertebrate animals. J Biochem Mol Biol 2005; 38:128–50. Cummings RD. The repertoire of glycan determinants in the human glycome. Mol Biosyst. 2009 Oct;5(10):1087-104. Bochner BS, Zimmermann N. Role of Siglecs and related glycan-binding proteins in immune responses and immunoregulation. J Allergy Clin Immunol 2015; 135:598–608. Coombe DR, Parish CR. Carbohydrates: the yet to be tasted sweet spot of immunity. Front Immunol 2015; 17(6):314. Gagneux P, Varki A. Evolutionary considerations in relating oligosaccharide diversity to biological function. Glycobiology 1999; 9:747–55. Vasta GR, Ahmed H, Nita-Lazar M, Banerjee A, Pasek M, Shridhar S, et al. Galectins as self/non-self recognition receptors in innate and adaptive immunity: an unresolved paradox. Front Immunol 2012; 3:199. Cohen M. Notable Aspects of Glycan-Protein Interactions.Biomolecules2015; 5(3), 2056-2072. Paulson JC, Blixt O, Collins BE. Sweet spots in functional glycomics. Nat Chem Biol. 2006 May;2(5):238-48. Schnaar RL. Glycans and glycan-binding proteins in immune regulation: A concise introduction to glycobiology for the allergist. J Allergy Clin Immunol. 2015 Mar;135(3):609-15. Khatua B, Roy S, Mandal C. Sialic acids siglec interaction: a unique strategy to circumvent innate immune response by pathogens. Indian J Med Res. 2013 Nov;138(5):648-62. Chang YC, Nizet V. The interplay between Siglecs and sialylated pathogens. Glycobiology. 2014 Sep;24(9):818-25.